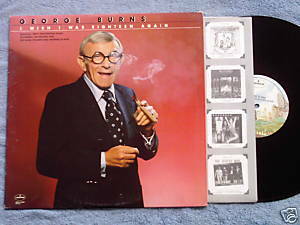 Mercury 1-5025 George Burns I Wish I Was Eighteen Again 1980 LP. Music and comedic sketches include title track, Arizona Whiz, Old Bones, Baby Song. Arranged and conducted by Bill Justis; produced by Jerry Kennedy. Vinyl is excellent; jacket is VG with minor corner wear and seam scuffing; inner sleeve has images of other 1980 Mercury recordings.